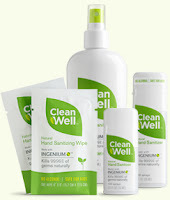 CleanWell is all-natural and alcohol-free. The ingredients are safe for kids, non-toxic, and come from rapidly renewable resources. I ordered a variety pack and it should arrive within the next few days. As soon as Aaron and I give it a try, I’ll report back with my review. Thanks, Ferret! Update:Another hit, Ferret. The variety pack arrived today. The product does have a slight scent of thyme, but it’s pleasant and not overpowering at all. My hands feel great. I have no idea if it actually kills 99% of germs as it advertises, but I’ll just assume it does and highly recommend this product! Thanks Ferret.